I have found another very promising way to earn money listening to music! Music XRay is the closest thing I've found so far to Slice the Pie — you actually get paid real money to listen to and rate songs. There are other sites, like Hit Predictor, that only award you with points that you can redeem. 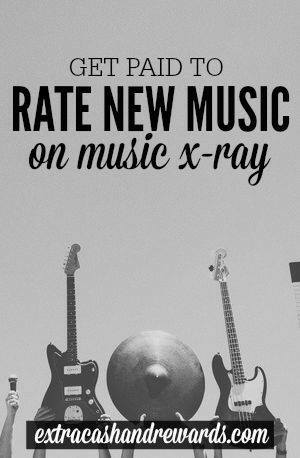 But Music XRay is the real deal, you do get cash. You have to associate your account with your Facebook profile to start. You'll have to fill out some basic profile information and they also ask that you upload a few mp3's that reflect your musical tastes so they can better match you to music. You don't have to upload the mp3's — I didn't do it and I have still gotten music invites in my inbox. Once your account is set up, you will occasionally get invitations to listen to and rate music. Rating involves listening to the entire track and then rating it on a scale of 1-5 stars. You also have to type in some comments saying what you liked or didn't like. How Much Does Music XRay Pay? Everyone gets paid ten cents a listen. You can get paid via Paypal once your account reaches $20. At first, they will come in slowly. But the more you rate, the more you'll start to receive. Please remember that to start with you only get 24 hours before your song invitations expire and are sent to someone else to do. After you've been rating for a while and your badge level increases, they will start giving you more time per song. Yes, they do. You can email invitations to people you know and get them to sign up for focus groups to rate music, too. As a reward for doing this, you'll get some more money per song once you've gotten 10 people to sign up. Well, there's not a lot to report on just yet. So far I have received two song invitations and made a whopping ten cents! But hey, I'll take it 🙂 I'm anxious to see how much better I do once my level starts increasing. I've only been a member for about five days. I think that you can at at this point probably earn more money listening to music by doing Slice the Pie because there you don't have to wait on invitations to listen — you just log in and start rating music. However, I have read some things here and there online where people who have built their badge level up on Music XRay are doing rather well. If your badge level is up there, you may be able to do as well here as you can on Slice the Pie. You can get started signing up by using this link. Good luck! Another interesting new way to make some extra cash from home! Thanks for sharing! This is very confusing bc other people have said they make $0.32 per song to starts. And $0.47 per song once you have gotten past 100 ratings. But in this article they are saying it’s only $0.05 per song? So is it a nickel or is it $0.32 per song to start????? The more songs you rate, the more you can earn. But yes, it does appear that you start off at just five cents. I started off at five cents but then after I had rated a few songs it jumped up to seven cents. And it will just keep going up from there the more you rate. Indeed, you start at five cents. Then, as you rate more songs, your level increases and so does your reward. See http://www.musicxray.com/badges for details. I have reached the ultimate “Music Mogul Elite” ranking and earn a whopping $0.42 per review. My custom built Porsche is arriving next week.